Our transportation service offers the easiest, most convenient way to transport your guests or clients to and from the airport. 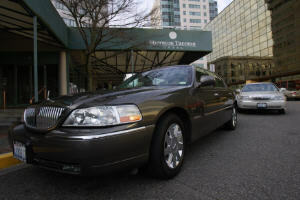 Our professional, uniformed drivers will pick up at any location, 24 hours a day, seven days a week, in private, comfortable Lincoln Town Car sedans and deliver to any destination. We gladly provide luxury transportation for the following: Airport, Proms, Shopping, Day Trips, Weddings, Concerts, Sight-Seeing Tours, Business Meetings, Parties, Doctors Appointments and Special Events. Van Shuttle services are also available by prior reservation. Please call for rates and availability. For the convenience of our corporate clients, customized billings are available. To have a VPS representive contact you regarding airport transportation service, please fill out the appropriate section of the form below. Filling out this form does not confirm service, a VPS representive will contact you to confirm your service. For transportation service other than airport, please contact our office.